Somalia is a country in the Horn of Africa, which also happens to be a peninsula and the most eastern area of the African continent. There are an estimated 14 million people living in Somalia as of 2016. They are better known as Somalis or the Somali people. The primary religion of the Somalis is Islam, making Somalia an Islamic nation. This means the traditional Muslim-based laws and customs are prominent in the society. Most notably, women are treated as second-class citizens and they must be subservient to men. The two official languages of Somalia are Somali and Arabic. Some of its secondary languages are English and Italian, but you can expect most people to speak Somali, Arabic, or both. A lot of foreigners, especially Muslim foreigners, will obviously be familiar with Arabic. However, Somali is a language that few people know outside of this region. This makes sense because it is a language that is native to the Somali people only. Many of them have immigrated to other countries, though. There are an estimated 16 million people in the world who speak Somali. Roughly 8.5 million of them are still living in Somalia. Most of the others who left Somalia are living in other African countries, such as Ethiopia (4.5 million) and Kenya (1 million). Due to the Muslim influence in the region, many ethnic Somalis have moved to the Middle East where their faith is even more adored. 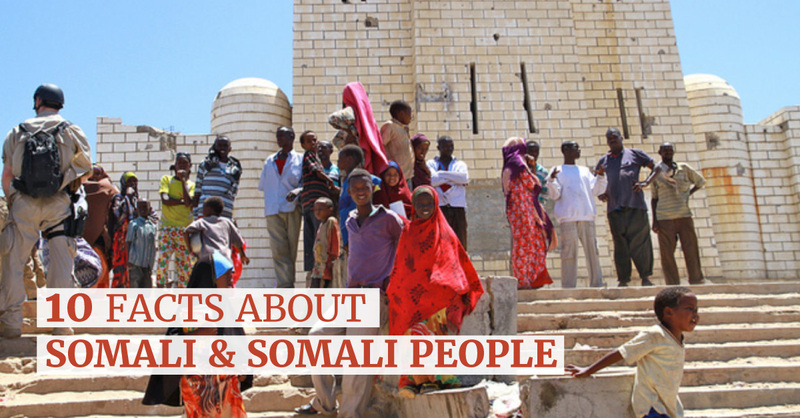 Here are 10 facts about the Somali culture that you might find interesting. 1) No Hijab – Even though Islam is the main religion in Somalia, the local women usually walk around without a hijab (or veil) over their faces. But they still must avoid speaking to men whenever they’re in a public place. 2) The Camel is Important – The camel is the most important animal to the Somali people. They use it for so many different things, including transportation, food, and earning money. Sometimes the status of a person is determined by whether they owned a camel too. 3) Forests and Waterfalls – When most foreigners think about Somalia, they just think of poor people and barren landscapes in the desert. But Somalia actually has a lot of beautiful forests and waterfalls too, such as the Lamadaya waterfall. 4) Weddings – Food is a very important element of weddings in Somalia. The family of the bride will often slaughter animals and serve the meat of the animals to the wedding guests. Bread will also be served as well. Families like to make these big celebrations, which is why they invite the poor as well as people connected to the bride and groom. 5) Education Diversity – About two-thirds of the adults in Somalia do not know how to read and write. Meanwhile, there are some fortunate Somalis who are highly educated and speak as many as 5 languages. 6) Texas Size – Somalia is a rather small country in comparison to other countries in Africa and around the world. If you look at the square footage of Somalia, it is a little bit less than the square footage of Texas in the United States. 7) Banana Leaf Scoops – Somalis traditionally eat with their fingers. First, they will prepare their food in a bowl. Instead of just eating from the bowl, they will either use three fingers to scoop out the food or they will use a rolled-up banana leaf to scoop it out. 8) Food Shortages – The Somalis are constantly short on food. About 6.9 million Somalis are malnourished or don’t know where their next meal is coming from. This is mostly due to the drought problem in the country, causing the crops to stop growing. 9) Variety of Exotic Animals – Somalia has a lot of different exotic animals, aside from just a camel. They have baboons, giraffes, cheetah, lions, and elephants too. If you explore the forest areas, you might come across them. 10) Ongoing Civil War – There has been an ongoing civil war in Somalia since 1991. It is estimated that over 500,000 people have been killed in the war so far. Although Somalia is a very poor country, they do have some commercial activities taking place their too stimulate their economy. Thanks to the help from the United States and various Middle Eastern countries, Somalia has been able to improve their seaports and telecommunication systems. Over the last 30 years, many Somali towns have established banking networks, electricity, and satellite telephones for the first time. Traditionally, the Somali economy has been based primarily on raising crops and livestock. It is also a country that is home to some natural resources, including iron ore, quartz, and uranium. Overall, the country exports a lot of coffee, cotton, fish, bananas, citrus fruits, and animal hides. Somalia is slowly adapting to the electronic and technological age. They’re starting to build more electronics factories in addition to their pharmaceutical factories and leather-tanning factories. If you can invest in these industries there, you will be able to get affordable high-quality labor to make your products. These are the best industries to invest in for the future. All the mining, fishing, and livestock markets are pretty much exhausted at this point. The Kurds are people of Iranian ethnicity who inhabit many Muslim-dominant countries in the Middle East and northern Africa, such as Iraq, Syria, Iran, Turkey, and Somalia. The Kurds have developed their own language too. In fact, there are three dialects to the language too; Southern Kurdish, Northern Kurdish, and Central Kurdish. If you want to communicate with the Kurds, you will need to be able to translate your words into their language. This will be beneficial for doing business with them too. If you want to reach the African market, you cannot rely on them knowing your language. You will need professional translators to properly relay your communication to them in their language. One company that can provide such a service is Future Trans. They are one of the most reputable language translation service providers throughout Africa and the Middle East. Their linguistic services take advantage of both human translators and advanced linguistic technology to deliver top-notch translations of many languages throughout these regions. They can provide you with Arabic translation services and different languages that people use to communicate between them. If you are trying to purchase products in these countries or do any kind of business in them, Future Trans can be your translator and communicator. Their goal is to ensure that you reach a new market for your business. Not only will this help you, but it will help the local people in these countries as well.